Our company Cheong Hing Trading Co. is one of the world’s biggest buyer and collector of natural Ox gallstones also known as Cattle Gallstones, Cow Bezoar, Calculus bovis, Bovine Gallstones, Niu Huang. Our office is located in the heart of the Ox Gallstones World Market in Hongkong. We supply our gallstones directly to the biggest manufacturers of Chinese traditional medicine in mainland China and Hongkong. Due to this fact our buying price is unbeatable! We offer market price or international price of Ox gallstones to all our suppliers worldwide. Once you have a discussion with us you can compare our buying price to that of the other buyers and for sure no one will beat us! We are capable of buying any quantity at any time! The Ox gallstones market is one of those rare market where demand has never been met. We have been in this business for more than 30 years. Ox gallstones is our bread and butter business. We know the ins and out of this business. We have suppliers from all over the world supplying us since many years ago. We have Ox gallstones suppliers from Australia, Argentina, South Africa, Nigeria, Tanzania, Uganda, Ethiopia, India, United Kingdom, France, Germany and many more countries. If you have Ox gallstones you want to sell, you have found the right business partner. Please fill the form below. In the past we used to go to many countries to collect Gallstones from our suppliers. But in the recent years due to the advancement of technology in money transfer such as TT and electronic email. We don’t need to travel anymore. Occasionally some of our suppliers bring their own Gallstones to our office in Hongkong. Ask any experienced Ox gallstones supplier about our company, you will only hear good news about us. We pay according to the market price of that day. No tricks, No cheating. Our suppliers love us for this because we are very ethical and professional in our business undertakings. We pay our suppliers in 24 hours upon receiving the goods. If you want to sell Gallstones to us, just send a message with your email, phone number and picture of Gallstones and we will start talking business straight away! Below is the screenshot of the recent purchase from our suppliers. 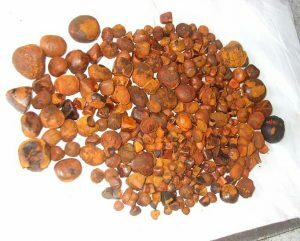 We prefer to buy 100g and up of well dried good quality natural Ox gallstones. We don’t buy artificial Ox gallstones or any other animal gallstones. If you prefer to come to our office physically in Hongkong send us an email or phone call for communication. Step 1. Send us an email of your available goods, photos, bank details and the date you are planning to send us your gallstones for discussion about our buying price per gram. Step 2. After sending the goods by DHL/EMS/Fedex send us the tracking number of the goods. Once we receive the goods we will send you the payment and email notification within 24 hours. We pay you according to the market price of that day. So you will always get the best market price with us. We work on a mutual benefit setting, so if the market is good, our buying price will reflect that as well. No cheating, No tricks. Let us talk about our long term Ox gallstones business, please fill the form below and we will get back you as soon as possible. What is an Ox gallstone? An Ox gallstone is clay-like stones found in the gallbladder of Bovine. The Bovine family include cow, ox, cattle and buffalo. What are the uses of Ox gallstones? 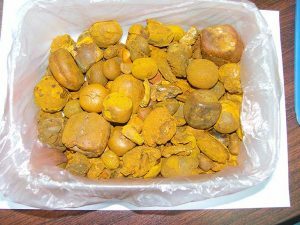 Ox gallstones are commonly used in the traditional Chinese medicine as an effective antidote for fever induced delirium, mania, convulsions in children, sore throat, acne, mouth sores, carbuncles.